Any predictions who might make it to the next round ?? However Real bounced back and are relevant again !! manU-PSG can go either way, ligue1 is not as tough as premier league and United have bounced back. it will be like Luffy vs Lucy, Lucy has been a great force in CP9 and Luffy is not to be underestimated. Ajax doesn’t stand a chance against Madrid, if they can loose to Heracles then Madrid will beat them very well, I’ll say G4 vs Kaido. Tottenham vs Dortmund will be like Akainu vs WB, they will both do a great damage but one will have a lucky escape but since Kane is not back, I’ll say its more like G4 vs doffy. I think PSG has a chance, because they have decisive players. ManU is the favorite but I don’t know if Martial or Pogba are as decisive as Cavani and Mbape. Roma wins. Real Madrid too. But David Neres from Ajax is a player to look at. Very skillful. I think Dortmund can win. But only if Kane and Lucas are both in a bad day. id say real wins this round… they have quality squad who have finally accustomned to life wthout cr7 and are in sublime form..
tottenham as much as i like them .. its too much for them ryt now with injuries and pl and now they face this dortmund team which has been on fire this season with sancho leading the way… dortmund wins bu ill be happy if tottenham wins too..
I’m curious to see what Ban is going to do. Especially now that he isn’t immortal. He’s still the only one without a sacred treasure. Recently, the Vivre Card – One Piece Visual Dictionary revealed that Shanks also possesses the ability to use Kenbunshoku Haki, in fact he has mastered to full extent all 3 types of Haki. Can you link the source? That’s one I haven’t seen yet. Jinsung, Kallavan, Maschenny, and Evan. No Yuri? I thought she was top 100. Yuri is ranked in Top 500. It might be surprising for some people considering Evan is ranked 95th. But I personally think that it’s reasonable. Evan is powerful, he saved Yuri several times from dangerous situations. It’s just his loyalty as a guide which made him looked weaker than Yuri. Yeah, I partially agree with you. I for once thought that Evankhell should have been ranked higher than Maschenny as well. But after rereading the Hidden Floor, I changed my mind. It seemed like most people had a wrong impression about Maschenny’s power. It might be true that Maschenny’s feats were not impressive (defeated by young Zahard, struggling to take down half-dead Jinsung), but it wouldn’t be right if we say that she didn’t deserve to be in Top 50. After all the opponents whom she confronted were all Top 25. It means that Maschenny might be way more powerful than most people assumed. Arie family has 2 known princesses, Haghipheorine and Rose. I think you are mistaking the former for the later here. The princess who was suspected in orchestrating Lilial-Shilial affair was Arie Rose, not Arie Haghipheorine. …Yeah, Haghipheorine was ranked 36th. Yeah, The Top 5 are invincible. Actually all Top 5 members besides Urek are considered inactive, but their incredible feats keep their names stay on the top for more than thousand years. They are more like demi-gods within The Tower. I don’t want the only badass design based character in Wano amongst Samurai to be on good side. He’s shady and dark which I like the most and if he turns out to be a hidden hero then I would be disappointed. Are you talking about Orochi? Even I’m wondering why people are cheering for Kyoshiro to protect either Robin or Komamuri in the first place lol. Kyoshiro even commands the calamities like Queen is heavily intriguing. I’ve started TOG and I’m at chapter 50. It’s become to get used to Manhwa which I’m reading for the very first time. Nice to have you on board my friend. Yeah, I had to get used as well. Manhwa is somewhat different with manga in some aspects. Let me know if you have some questions regarding this series. I will provide you with the best answers from reliable sources out there. Thank you & sure my friend. Don’t let the art decides whether you are continuing or not. Just keep reading. The art is not only getting better, but amazing. Yea sure buddy. TBH art isn’t that good. The Santoryuu Pirate Swordsman who seeks to become the World’s Strongest Swordsman! He is a swordsman formerly invited to join Baroque Works, known by the epithet of ‘Pirate Hunter’! To fulfil his promise with Kuina, he aims to become the WSS. Wielding his three-sword style, grasping a sword in both hands and in his mouth, he overwhelms his opponents with astonishing drive. After the Summit War, he trained under the Warlord Mihawk. He has a strong sense of duty, a masculine spirit. When his nakama are in a crisis, he plays a role like a vice-captain, delivering judgments with a cool head. His strength is second only to the captain, so he takes on an enemy organisation’s second strongest. For the sake of his nakama, he will throw away his pride and bow his head to his arch enemy! He will not hesitate to sacrifice himself, such is the spirit of Bushido! The only sword that did not break during his battle with Mihawk. His one memento of his dear friend Kuina. In his character sheet, he professes to be a self made man. His female version drawn in an SBS would discard Santoryuu!? Fem Zoro: Santoryuu? No way! My teeth will break. -Zoro is second only to Luffy in the crew, in strength. -He acts as the Vice Captain when needed. Now this should stop the talk about “is Zoro = luffy or = to sanji” and enough with the talk about “is zoro the vice captain or not?”. I think we all already know that. I think most of the arguments is whether the monster trio are close in strength or not. Trust me, many argue against the obvious. What Sanji did is definitely the same. Except when Zoro did it, it was on a grander scale because the one he bowed down to was his life goal. Did you even comprehend what happened in page 3 of chapter 931? 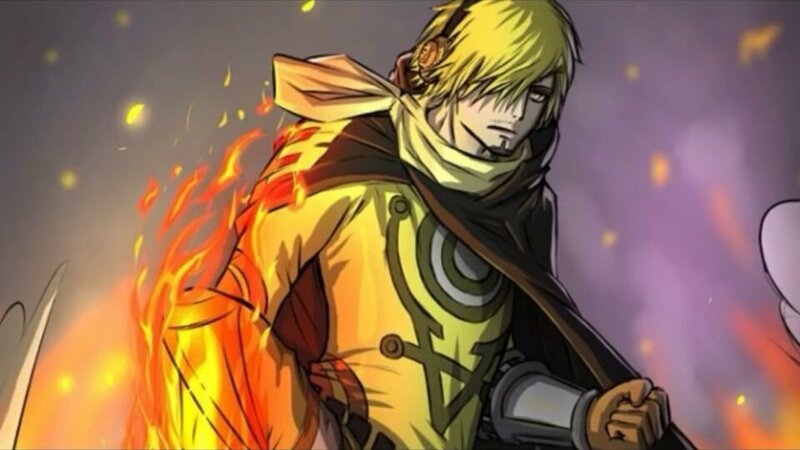 Although sanji’s card doesn’t indicate his strength position in the crew, it says his strength is top class where the same is said about his cooking and if sanji is one of the best cooks in the world, then this means he is one of the strongest in the world ;). It says also that he is like the advisor to the crew. The haters are going to cry themselves and scream “a**pull” when Sanji fögets his fight thid arc. the crew doesn’t care about ranks liek Others crews. or how nami is in charge most of the time. the point is that they are like family, friends. also, if it’s not stated i nthe manga, take it with a grain of salt. remeber when databook said Sabo is dead? Ιn databook yellow (or green im not sure) though Zoro was depicted as Luffy’s equal. really? you got a link? also the 3 sweet commanders, 3 calamities, show there is no clear vice, since they have mosre close i npower. Who said Oden was the fourth strongest in Rogers crew? It makes sense but where was that confirmed? it makes sense, not confirmed. There is a clear vice captain for BM it was stated Katakuri is the strongest of the sweet commanders. second strongest but he is not superior in rank to the other sweet commnaders. Then why did you say “they have mosre close i npower.” They are close but Katakuri is stronger. The databook states standings as they are now by the end of the series Zoro will be stronger than Mihawk. Right now Mihawk > Shanks and Shanks was said to be the closest man to one piece (somewhere). So end of series Zoro = End of series Luffy is obvious. mihawk said he Waits for someone to suprass even shanks in swordmanship. Aokiji gave scars to Akainu so Aokiji > Akainu? Same thing with Shanks. Shanks beat BB in the fight where BB gave him scar. He got scar because he underestimated BB. Fair enough but BB says it himself at MF it’s too early for him to fight Shanks. No can seriously believe BB > Shanks when Shanks got the scar. it was said only extreme battles increases your haki nad makes you stronger. it’s just how kaiodu is on par with 3 other people, yet he is strongest. they might be equal in term of level. but one has more odds than others. Usopp is the real vice captain of Straw Hat Pirates. they are the most similar in terms of personality, acting like kids. They are family. Big-bro-lil-bro quarrel. so don’t we lack grandma i nthe crew? I swear I told you and others about it years ago. Next crew mate has to be female. But you guys keep saying male minks, male giants, male dwarfs lol. Although I have changed my mind about it. It seems Oda knows that fans has discovered his nakama formula. Oda once said that he would change the story if fans happen to predict it correctly. So in this case I doubt Oda would keep 13 nakama formula. I’m sure Carrot is replacing this female nakama. The role which Carrot play now is supposed to be female nakama’s, but because fans correctly predicted Jinbe, Oda decided to dispose the 13 nakama formula (MFMM formula), and make Carrot as a substitute character for next female nakama. yeah but it’s forced. no way he would survive mr 1 slashes or kuma ball of pain. he is just normal human. as roma won but it was quite a struggle..